Playful, yet full of raw power; delicate and brutal at the same time; driving rhythms coupled with dizzying guitar solos … Coroner is all this and more. Is it thrash metal? Is it speed metal? Is it technical death metal? This Swiss band cannot be pigeonholed. It is unique … even after 30 years on the go. Coroner’s brand of metal is all about complex rhythms and intricate melodies coupled with outstanding technique. The band’s music is driven by Ron’s accurate bass sequences, which push his instrument to the limit of what is possible, and Marky’s drum patterns, that just cannot stick to the straight-and-narrow of four-four time. All of this underpins Tommy’s virtuoso guitar sequences, razor-sharp masterpieces with a neoclassical touch that earned him a reputation as one of the world’s best metal guitarists. 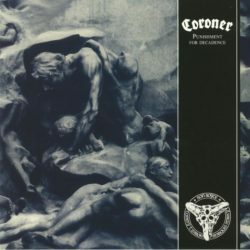 But this uniqueness was also a liability: the band was often underrated; most metal fans had no time for the artistic complexity of Coroner’s music. Tension arose between the band members. Their perfectionism and the resurgence of a desire to explore other musical styles drove the three men apart. Coroner split after one last tour in 1996. They may not have performed with each other for 15 years, but they certainly were not inactive. Tommy Vetterli toured with Swiss pop star Stephan Eicher and became a member of the German metal band Kreator. Marky joined Tom G. Warrior’s project Apollyon Sun and experimented with electronic music. Ron withdrew from the metal scene, occasionally playing bass in a variety of projects.